1. Neurological symptoms can be caused by compressive hematoma in case of hemorrhagic dengue fever. 2.Differential diagnosis and management of compressive neuropathy in hemorrhagic dengue fever. Dept of Orthopaedics Lady Harding Medical College and Smt Sucheta Kriplani Hospital, New Delhi, India. Dept of Orthopaedics, Dr RML Hospital New Delhi, India. Dr. Ashutosh Jha : Dept of Orthopaedics Lady Harding Medical College and Smt Sucheta Kriplani Hospital, New Delhi, India. Case Report: We report a case of acute compressive ulnar neuropathy due to peri neural hematoma, following an attempt at intravenous cannulation in the cubital fossa in a patient of dengue haemorrhagic fever with thrombocytopenia. Immediate fasciotomy and removal of haematoma was performed to relieve the symptoms. Conclusion: Compression neuropathies can be seen in dengue hemorrhagic fever and removal of compressing hematoma relieves symptoms. Keywords: Dengue haemmorrhagic fever; coagulopathy; peri neural haematoma. Compressive neuropathy has been reported following various forms of bleeding disorders including Haemophilia and Henoch Schonlein purpura [1,2]. However, to the best of our knowledge, development of acute compressive ulnar neuropathy of forearm in a patient of dengue fever with thrombocytopenia has not been reported. We report a case of 26 year male who was referred from department of general medicine with a rapidly progressive swelling along with severe pain in the volar aspect of proximal one third of right forearm following a history of intravenous puncture over right cubital fossa for an attempted intra venous cannulation few hours back. He had associated tingling and numbness along the distribution of ulnar nerve. His general and systemic examination revealed no significant abnormality apart from mild pallor and high grade fever (1020 F). There was no evidence of internal or external bleeding. Blood investigations revealed Haemoglobin 12.9gm%, TLC 10,000 with 54% lymphocytes, 44% polymorphs and 2% eosinophil and platelet count of 50,000/cumm. Bleeding time was elevated(10 seconds) as expected due to thrombocytopenia and clotting time was high borderline ( 8 min). Values of PT/INR were normal and there was neither evidence of generalised external or internal bleeding nor any features of disseminated intravascular coagulation (DIC). NS1 antigen test was positive for dengue. Local examination revealed diffuse tense and tender swelling of size 10cm x5cm over the ulnar aspect of proximal 1/3rd of right forearm. Careful examination revealed IV puncture mark in right cubital fossa (Fig 1). Overlying skin appeared shiny and tense. Pain on passive extension of fingers was positive. Active finger and wrist flexion were painful and restricted terminally. Radial pulse was palpable and comparable to opposite side and capillary refill time was 1.5 seconds. There was ulnar claw hand (Fig. 2) with weakness of both palmar and dorsal interossei muscles. Sensory loss over distribution of ulnar nerve in hand and paraesthesia over volar aspect of forearm were also noted. X-ray of forearm with elbow revealed anterior extra articular soft tissue shadow with no periosteal reaction. MRI of right forearm was suggestive of diffuse extensive soft tissue oedema, admixed with bleed along the flexor compartment of proximal forearm, involving skin, subcutaneous and intramuscular fat planes, and muscles of the flexor compartment with extension up to ulnar neurovascular bundle in the proximal one third. However flow void of forearm vessels were well maintained. The patient was transfused two units of platelet. 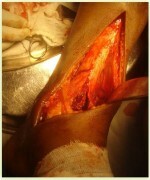 Immediate fasciotomy of volar compartment of forearm was done (Fig. 3). 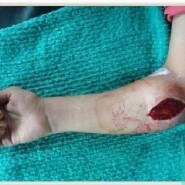 The underlying haematoma causing compression of ulnar nerve was evacuated. Underlying muscle was tense but healthy and contractile. The skin incision was deliberately kept small (approx. 3 inches) to minimise blood loss but fasciotomy was extended up to the middle 1/3rd of forearm. Post operatively the limb was elevated and active finger movements were encouraged. Patient had immediate relief in pain. Post operatively platelet count further dropped to 25,000/cumm. He was transfused one unit of platelet immediately in the post-operative period. The patient required frequent change of dressing during first 24 hours, due to excessive oozing. Tranexamic acid injection was started (500mg TDS) to control bleeding. Twelve hours post operatively the patient was again transfused with one units of single donor platelet after which platelet count increased to 40,000/cumm. By third post operative day the platelet count was 1.2 lakh/mm3 with minimal local soakage of dressing. Sensory symptoms completely recovered by 5th post op day however motor weakness recovered partially. On 18th post op day fasciotomy wound was closed and patient was discharged on a knuckle bender splint. Follow-up at 12 weeks revealed significant motor recovery however there was persisting weakness of 4th palmar interossei muscle (Fig. 4). EMG study at 12th post-operative week was suggestive of normal recordings in first dorsal interossei but no recordable activity of 4th palmar interosssei muscle. Major pathophysiological change seen in Dengue haemorrhagic fever/Dengue shock syndrome is acute increase in vascular permeability leading to loss of plasma from vascular compartment. The haemostatic changes in Dengue haemorrhagic fever are due to vascular changes, thrombocytopenia and disorders of coagulation. All patients demonstrate an increase in capillary fragility, reflected by positive tourniquet test and easy bruising. Invasive devices and procedures should be limited to those that are strictly necessary as they may lead to severe bleeding in presence of coagulopathy . In this case attempted IV cannulation near right cubital fossa, probably lead to peri-neural haematoma with features of compressive ulnar neuropathy. Compressive neuropathy due to hematoma has been reported following various forms of vascular access. These include attempts at obtaining access in the presence of a coagulopathy  and arterial catheter removal . Increased tissue pressure with accidental interstitial infusions of packed red cells  or normal saline  as well as hypertonic saline  have also been described. Vascular disruption or catheter misplacement can occur during IV cannulation which may lead to impaired perfusion distal to the injury and increased tissue pressure by the extravasated blood or fluid . MRI was done in our case to rule out vascular injury. Neurological features have been variously associated with dengue fever with incidence ranging from 3 to 25% . Mostly these are due to neurotrpism of the virus or immune mediated neuronal injury although metabolic and systemic complication of hemorrhage may also contribute [11,12]. Commonly associated neurological manifestations of dengue fever are encephalitis, meningitis, myelitis, encephalopathy, stroke, hypokalemic paralysis, Guillain Barre syndrome, brachial and optic neuritis and axonal polyneuropathy [10-14]. Although subdural hemorrhage and other intracranial hemorrhage have been reported with neurological features, this is rarely attributed to be compressive in origin . We believe this is the first case where compressive neuropathy is reported in association with dengue fever although this was secondary to an attempt to venipuncture. In this case features of compressive neuropathy were well established along the course of ulnar nerve in right forearm. Immediate identification of pathology and decompression by fasciotomy is of paramount importance to prevent further damage because the hematoma present inside a tight fascial compartment can lead to advanced features of compressive neuropathy which may include even total loss of both motor and sensory function. Two pathological mechanisms are believed to be involved in such peripheral nerve injuries: mechanical compression and ischemia. The authors of tourniquet experiments performed in the 1930s demonstrated that, at least in short-term compression, ischemia and not the pressure itself causes the resultant physiological conduction block . Compressive neuropathies from hematomas have also been described in haemophilics on treatment with anticoagulation drugs . Such compressive neuropathies usually recover completely depending upon the duration for which compression and ischemia have caused the assault. In this case there was complete sensory recovery by 5th post-operative day; however motor power was yet to recover fully till 24th post op week. Our intent, in this presentation is to highlight a new mode of compression neuropathy manifestation in association with dengue haemorrhagic fever, which is endemic in various parts of India. The Authors will like to acknowledge the Manuscript Assist & Publishing Service (MAPS) of Indian Orthopaedic Research Group for help in improving the manuscript content. 1.Yaycioglu S, Hakan AK. Concomitant Ulnar and Median Nerve Entrapment Due to Spontaneous Hematomas at Humerus Mid-Shaft Under Warfarin Treatment: Case Report. J Neurol Sci [Turk] 2010;27:239-243. 2 Luis GE, Ng ES. Acute compartment syndrome of the hand in Henoch-Schonlein Purpura. J Med Case Rep. 2007 Mar 2;1:6. 4. Halpern AA, Mochizuki R, Long CE III. Compartment syndrome of the forearm following radial-artery puncture in a patient treated with anticoagulants. J Bone Joint Surg (Am) 1978; 60: 1136–7. 5. Eaton RG, Green WT. Volkmann’s ischemia. A volar compartment syndrome of the forearm. Clin Ortho Rel Res 1975; 113: 58–64. 6. Maor P, Levy M, Lotem M, Fried A.Iatrogenic Volkmann’s ischemia – a result of pressure-transfusion. Int Surg 1972; 57: 415–6. 7. Mubarak SJ, Carroll NC. Volkmann’s contracture in children: aetiology and prevention. J Bone Joint Surg1979; 61B: 285–93. 8. Mabee JR, Bostwick TL, Burke MK. Iatrogenic compartment syndrome from hypertonic saline injection in bier block. J Emerg Med 1994; 12: 473–6. 9. Matsen FA III. Compartmental syndrome. An unified concept. Clin Orthop 1975; 113: 8–14. 10. Kamath SR, Ranjit S. Clinical features, complications and atypical manifestations of children with severe forms of dengue hemorrhagic fever in South India. Indian J Pediatr. 2006 Oct;73(10):889-95. 11. Puccioni-Sohler M, Orsini M, Soares CN. Dengue: a new challenge for neurology. Neurol Int. 2012 Oct 5;4(3):e15. 12. Verma R, Sharma P, Garg RK, Atam V, Singh MK, Mehrotra HS. Neurological complications of dengue fever: Experience from a tertiary center of north India. Ann Indian Acad Neurol. 2011 Oct;14(4):272-8. 13. Murthy JM. Neurological complication of dengue infection. Neurol India. 2010 Jul-Aug;58(4):581-4. 14. Verma R, Sharma P, Khurana N, Sharma LN. Neuralgic amyotrophy associated with dengue fever: case series of three patients. J Postgrad Med. 2011 Oct-Dec;57(4):329-31. 15. Mittal M, Jain N. Subdural haematoma and axonal polyneuropathy complicating dengue fever. BMJ Case Rep. 2011 Jun 17;2011. 16. Burnett MG, Zager EL. Pathophysiology of peripheral nerve injury: a brief review. Neurosurg Focus. 2004 May 15;16(5):E1. 17. Lewis T, Pickering GW, Rothschild P. Centripetal paralysis arising out of arrested bloodflow to the limb. Heart 1931; 16:1–32.